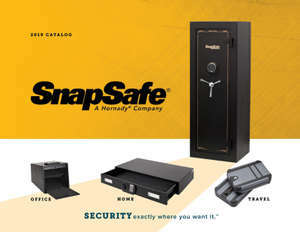 Store valuable belongings out of sight while maintaining easy access with the SnapSafe Trunk Safe. Large capacity anti-theft protection for multiple firearms, tools, equipment, important documents, jewelry, cash, electronics such as laptops and tablets, as well as other valuables. Ideal for securing valuables in your car, SUV, RV and home. Durable, heavyweight materials for true anti-theft protection. Non-slip feet, internal hinges and premium gas shocks for effective and safe operation. Internal hinges and premium gas shocks that provide smooth and safe operation. 3 foot, 1,500lb security cable for additional security when tethered to a stationary object.